Love the stats Eric thanks for the updates. Atleast there are no gaps beyond the 12th. GFS has been consistent with some precip in the way of thunderstorms for region by the weekend as you mentioned. Theres also a hint of a signal at the end of the run with the models but too far to tell if its a big event yet. You have the wonder where is all the evaporation going from the coral sea? surely it's not drying out up above? I would have.to fathom a guess Gleno and point the bone at our old friend the high pressure ridge or the squidge as it is affectionately known.Occasional shower off the coast in the moist south easterly most of the time. A bit over an hour ago, I was down by the riverside for a little while and could see the near-constant lightning being produced by storms about 100-110kms SW of here. STW is current for Heavy Rain, Large Hail and Damaging Winds. Although we're within the warning area now, the storms will need to keep building northward if we're to get anything here tonight. A storm hit here just after 1am. It went through fairly quickly, with a burst of moderate to heavy rain and strong winds (approx peak 70km/h). 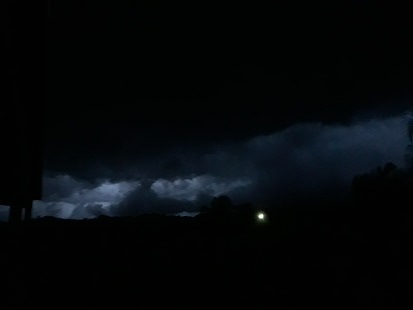 The storm line was producing very frequent lightning as it approached and moved through. It eased and cleared off to light rain, until a weak storm moved in a bit later bringing steady to briefly borderline moderate rain, and fairly infrequent though noisy lightning/thunder. My station recorded 9.5mm from those storms - wind gust of 31.3km/h though my station is a fairly protected from the wind by a number of trees which block the worst of it so the reading will be low unfortunately. Yeah get a better run-up for wind here with no trees/bushland near the house (only the odd palm tree in other neighbour's yards, which come in handy when guesstimating wind speed). Coffs got the best of the wind with 82km/h gusts. Reasonable falls of over 25mm to the west of Port and southwest of Kempsey, including 55mm at Elands and 50mm at Mt Seaview. A narrow storm band quickly passed through around 8:10am. Only brief steady rain, however it still managed to produce occasional lightning/thunder. 13.8mm in the 24hrs to 9am here. Nobody watching the radar? Just took a peek. Thought there was something nice about to the South with all that darkish high cloud & another quality sunset! Good looking harbinger for the next few days. There was a glorious sunset out at Plainlands tonight, all pinks and purples. There is a rumbling in the distance but doesn't seem to be amounting too much. Very strong storm moved through Inglewood this evening. The AWS there recorded 61mm in an hour, and 87km/h wind gusts. After the mid-morning storm band moved through parts of the northern MNC, the weak southerly soon came through and began to stabilise things, so storms remained on and west of the tablelands this afternoon/evening. Been a few brief showers here tonight falling from low-level cloud. GFS indicating there may storms about the coastal areas in the local region tomorrow, however EC and ACCESS aren't so keen on the idea. Doesn't look like the current hot, dry pattern is gonna break for a while. This weekends storms have faded into oblivion, models not showing anything of interest either apart from something at the end of extended GFS fantasy land. 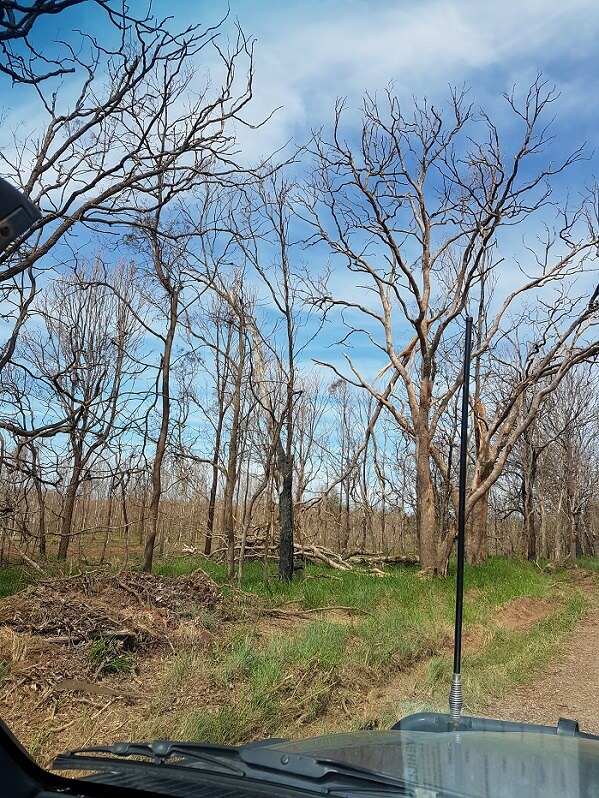 While its quiet in here I'll share a few pics I snapped today during my travels of the storm damage from the boxing day supercell west of Kingaroy. Was probably another 3km west of the photos I posted in the event thread at the time. 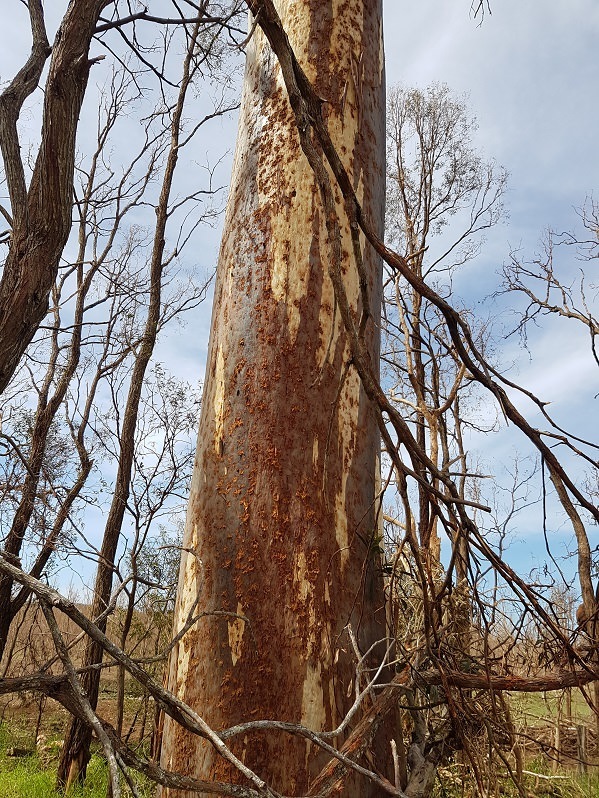 Even 2 and a bit weeks later the trees are still completely defoliated and scarred from the hail, looked like a cat 3 cyclone had gone through the place. A few houses with windows boarded up in the area as well. Certainly a storm I'll never forget thats for sure. Heavy falls in the Armidale area up on the Northern Tablelands today from thunderstorms. Armidale Airport has recorded 68.8mm since 9am. 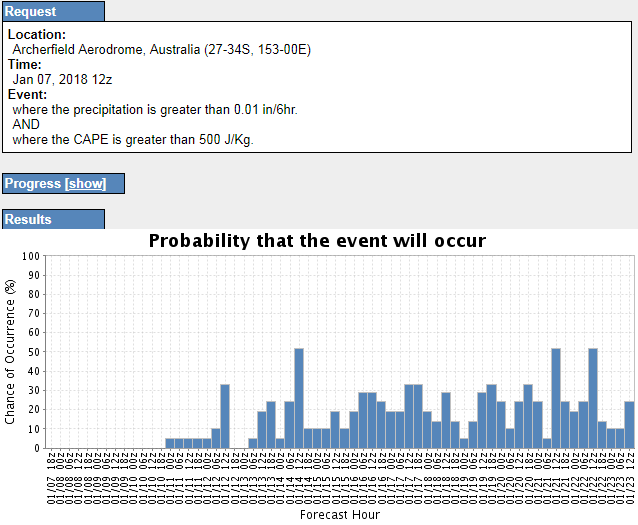 Making it the wettest January day on record at the Airport site (24yrs of records), and combining the records of the three Armidale sites that have existed, the wettest January day since 1964 (75.9mm). 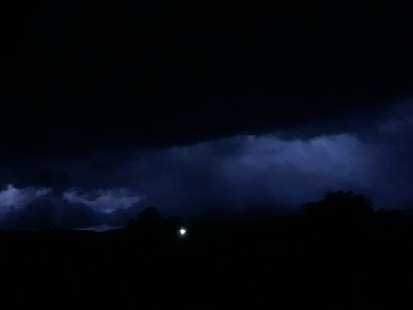 On the coast, a couple of storms did manage to form around the Nambucca and Bellinger Valleys this evening. A little distant thunder was heard here from one near Macksville. I wouldn't call it now by any means. Just going back to last year, we had pretty average rain in January, and then below average in February and the first half of March, and then the heavens opened in a spectacular way with two rain events in the second half of March (one pre-Debbie and Debbie herself). On the flip side, it was distinctly dry post-2011 floods in SEQ. Nobody was really worried though as everybody was thoroughly sick of the rain by this time 7 years ago. There's still a solid three months for things to get going, not to mention the forecast for Australia Day is still yet to come out. Something about that public holiday which attracts pouring rain. 8 day WATL looks great for North Oz, not so much for us. Wish it would hurry up & move south. Yeah, we're really hurting at home now. 2mm so far for 2018, and only 50mm in Dec. I haven't mowed for 3 weeks!!! Unheard of haha. Seeing all the pictures floating around FB of the 2011 January floods has given me a bit of perspective though... those were some tough times. Generated in 0.036 seconds in which 0.022 seconds were spent on a total of 14 queries. Zlib compression disabled.